Action And Clinical Pharmacology: Zopiclone, a cyclopyrrolone derivative, is a short-acting hypnotic agent. 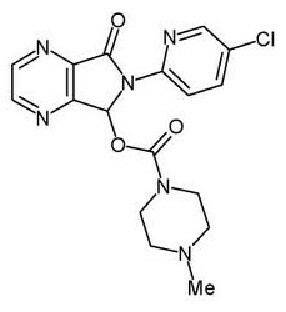 Zopiclone belongs to a novel chemical class which is structurally unrelated to existing hypnotics. However, the pharmacological profile of zopiclone is similar to that of the benzodiazepines. In sleep laboratory studies of 1- to 21-day duration in man, zopiclone reduced sleep latency, increased the duration of sleep and decreased the number of nocturnal awakenings. Zopiclone delayed the onset of REM sleep but did not reduce consistently the total duration of REM periods. The duration of stage 1 sleep was shortened, and the time spent in stage 2 sleep increased. In most studies, stage 3 and 4 sleep tended to be increased, but no change and actual decreases have also been observed. The effect of zopiclone on stage 3 and 4 sleep differs from that of the benzodiazepines which suppress slow wave sleep. The clinical significance of this finding is not known. With hypnotic drugs, the duration of hypnotic effect and the profile of unwanted effects may be influenced by the alpha (distribution) and beta (elimination) half-lives of the administered drug and any active metabolites formed. When half-lives are long, the drug or metabolite may accumulate during periods of nightly administration and be associated with impairments of cognitive and motor performance during waking hours. If half-lives are short, the drug and metabolites will be cleared before the next dose is ingested, and carry-over effects related to sedation or CNS depression should be minimal or absent. If the drug has a very short elimination half-life, it is possible that a relative deficiency (e.g., in relation to the receptor site) may occur at some point in the interval between each night's use. This sequence of events may account for 2 clinical findings reported to occur after several weeks of nightly use of rapidly eliminated benzodiazepines or benzodiazepine-like hypnotics: 1) increased wakefulness during the last third of the night and 2) the appearance of increased day-time anxiety (see Warnings). During nightly use and for an extended period, pharmacodynamic tolerance or adaptation to some effects of benzodiazepines or benzodiazepine-like hypnotics may develop. However in 2 sleep laboratory studies involving 17 patients, there was an absence of tolerance with zopiclone for treatment periods of more than 4 weeks. Rebound insomnia: A transient syndrome whereby the symptoms that led to treatment with a benzodiazepine or benzodiazepine-like agent recur in an enhanced form, may occur on withdrawal of hypnotic treatment. Some manifestations of rebound insomnia have been reported both in sleep laboratory and clinical studies following the withdrawal of zopiclone. Zopiclone treatment was associated with dose-related residual effects (see Precautions). Pharmacokinetics: Absorption: Zopiclone is rapidly and well absorbed. Bioavailability is more than 75%, indicating the absence of a significant first-pass effect. After the administration of 7.5 mg doses, peak plasma concentration of 60 ng/mL were reached in less than 2 hours. Absorption was similar in males and females. Repeated daily administration of a 7.5 mg oral dose for 14 days did not change the pharmacokinetic characteristics of zopiclone and did not lead to accumulation. Distribution: Zopiclone is rapidly distributed from the vascular compartment (distribution half-life [t1/2a]:1.2 hours) while the elimination half-life is approximately 5 hours (range: 3.8 to 6.5 hours). Plasma protein binding is low (approximately 45% in the 25 to 100 ng/mL concentration range) and nonsaturable. The risk of drug interaction arising from displacement of bound drug is low. Metabolism: Zopiclone is extensively metabolized by 3 major pathways; only about 4 to 5% of the drug is excreted unchanged in the urine. The principal metabolites are the N-oxide derivative (approximately 12%) which has weak pharmacological activity in animals, and the N-desmethyl metabolite (approximately 16%) which is pharmacologically inactive. Their apparent half-lives evaluated from the urinary data are approximately 4.5 and 7.4 hours, respectively. Both metabolites are excreted renally. Other metabolites resulting from oxidative decarboxylation are partly eliminated via the lung as carbon dioxide. In animals, zopiclone did not induce hepatic microsomal enzymes. Excretion: Excretion studies, using C4zopiclone have shown that more than 90% of the administered dose was excreted over a period of 5 days, 75% being eliminated in the urine and 16% in the feces. The low renal clearance of unchanged zopiclone (mean 8.4 mL/min) compared with that of plasma (232 mL/min) indicates that zopiclone clearance is mainly metabolic. Special patient populations: Elderly subjects: The absolute bioavailability of zopiclone was increased (94% vs 77% in young subjects) and the elimination half-life prolonged (approximately 7 hours). Accumulation has not been observed on repeated dosing. Patients with hepatic insufficiency: Elimination half-life was substantially prolonged (11.9 hours) and time to peak plasma levels delayed (3.5 hours). Consequently, lower doses are recommended (see Dosage). Patients with mild to moderate renal insufficiency: The pharmacokinetics of zopiclone were not affected. Hemodialysis did not appear to increase the plasma clearance of the drug. Lactating women: Zopiclone was present in the milk, its concentration paralleled plasma levels but was about 50% lower. Indications And Clinical Uses: Sleep disturbance may be the presenting manifestation of a physical and/or psychiatric disorder. Consequently, a decision to initiate symptomatic treatment of insomnia should only be made after the patient has been carefully evaluated. For the symptomatic relief of transient and short-term insomnia characterized by difficulty in falling asleep, frequent nocturnal awakenings and/or early morning awakenings. Treatment with zopiclone should usually not exceed 7 to 10 consecutive days. Use for more than 2 to 3 consecutive weeks requires complete re-evaluation of the patient. Prescriptions for zopiclone should be written for short-term use (7 to 10 days) and it should not be prescribed in quantities exceeding a 1-month supply. The use of hypnotics should be restricted for insomnia where disturbed sleep results in impaired daytime functioning. Manufacturers' Warnings In Clinical States: Zopiclone should be used with caution in patients who in the past manifested paradoxical reactions to alcohol and/or sedative medications. Geriatrics: The smallest possible effective dose should be prescribed for elderly patients. Inappropriate, heavy sedation in the elderly, may result in accidental events/falls. The failure of insomnia to remit after 7 to 10 days of treatment may indicate the presence of a primary psychiatric and/or medical illness or the presence of sleep state misperception. Worsening of insomnia or the emergence of new abnormalities of thinking or behavior may be the consequence of an unrecognized psychiatric or physical disorder. These have also been reported to occur in association with the use of drugs that act at the benzodiazepine receptors. Zopidone should be used with caution in patients who have myasthenia gravis or severe hepatic insufficiency. Pregnancy: Benzodiazepines may cause fetal damage when administered during pregnancy. During the first trimester of pregnancy, several studies have suggested an increased risk of congenital malformations associated with the use of benzodiazepines. Insufficient data are available on zopiclone to assess its safety during human pregnancy. Thus, the use of zopiclone during pregnancy is not recommended. If zopiclone is prescribed to a woman of childbearing potential, the patient should be warned of the potential risk to a fetus and advised to consult her physician regarding the discontinuation of the drug if she intends to become pregnant or suspects that she is pregnant. During the last weeks of pregnancy, ingestion of therapeutic doses of a benzodiazepine hypnotic has resulted in neonatal CNS depression due to transplacental distribution. Similar effects can be expected to occur with zopiclone, due to its pharmacological effects. Memory Disturbance: Anterograde amnesia of varying severity has been reported following therapeutic doses of benzodiazepines or benzodiazepine-like agents. The event is rare with zopiclone. Anterograde amnesia is a dose-related phenomenon and elderly subjects may be at particular risk. Cases of transient global amnesia and "traveller's amnesia" have also been reported in association with benzodiazepines, the latter in individuals who have taken the drug, often in the middle of the night, to induce sleep while travelling. Transient global amnesia and traveller's amnesia are unpredictable and not necessarily dose-related phenomena. Patients should be warned not to take zopiclone under circumstances in which a full night's sleep and clearance of the drug from the body are not possible before they need again to resume full activity. Abnormal thinking and psychotic behavioral changes: Abnormal thinking and psychotic behavioral changes have been reported to occur in association with the use of benzodiazepines and benzodiazepine-like agents including zopiclone, although rarely. Some of the changes may be characterized by decreased inhibition, e.g., aggressiveness or extroversion that seems excessive, similar to that seen with alcohol and other CNS depressants (e.g., sedative/hypnotics). Particular caution is warranted in patients with a history of violent behavior and a history of unusual reactions to sedatives including alcohol and the benzodiazepines or benzodiazepine-like agents. Psychotic behavioral changes that have been reported include bizarre behavior, hallucinations, and depersonalization. Abnormal behaviors associated with the use of benzodiazepines or benzodiazepine-like agents have been reported more with chronic use and/or high doses but they may occur during the acute, maintenance or withdrawal phases of treatment. It can rarely be determined with certainty whether a particular instance of abnormal behaviors listed above is drug induced, spontaneous in origin, or a result of an underlying psychiatric disorder. Nevertheless, the emergence of any new behavioral sign or symptom of concern requires careful and immediate evaluation. Confusion: The benzodiazepines and benzodiazepine-like agents affect mental efficiency, e.g., concentration, attention and vigilance. The risk of confusion is greater in the elderly and in patients with cerebral impairment. Anxiety, restlessness: An increase in daytime anxiety and/or restlessness have been observed during treatment with zopiclone. This may be a manifestation of interdose withdrawal, due to the short elimination half-life of the drug. Depression: Caution should be exercised if zopiclone is prescribed to patients with signs and symptoms of depression that could be intensified by hypnotic drugs. The potential for self-harm (e.g., intentional overdose) is high in patients with depression and thus, the least amount of drug that is feasible should be available to them at any one time. Precautions: Drug Interactions : Zopiclone may produce additive CNS depressant effects when coadministered with alcohol, sedative antihistamines, anticonvulsants, or psychotropic medications which themselves can produce CNS depression. Compounds which inhibit certain hepatic enzymes (particularly cytochrome P450) may enhance the activity of benzodiazepines and benzodiazepine-like agents. Examples include cimetidine or erythromycin. Drug abuse, Dependence and Withdrawal: Withdrawal symptoms, similar in character to those noted with barbiturates and alcohol (convulsions, tremor, abdominal and muscle cramps, vomiting, sweating, dysphoria, perceptual disturbances and insomnia) have occurred following abrupt discontinuation of benzodiazepines and benzodiazepine-like agents, including zopiclone. The more severe symptoms are usually associated with higher dosages and longer usage, although patients given therapeutic dosages for as few as 1 to 2 weeks can also have withdrawal symptoms including daytime anxiety between nightly doses. Consequently, abrupt discontinuation should be avoided and a gradual dosage tapering schedule is recommended in any patient taking the drug for more than a few weeks. The recommendation for tapering is particularly important in patients with a history of seizures. The risk of dependence is increased in patients with a history of alcoholism, drug abuse, or in patients with marked personality disorders. Interdose daytime anxiety and rebound anxiety may increase the risk of dependency in zopiclone treated patients. As with all hypnotics, repeat prescriptions should be limited to those who are under medical supervision. Patients With Specific Conditions: Zopiclone should be given with caution to patients with impaired hepatic or renal function, or severe pulmonary insufficiency. Respiratory depression has been reported in patients with compromised respiratory function. Patients Requiring Mental Alertness: Because of zopiclone's CNS depressant effect, patients receiving the drug should be cautioned against engaging in hazardous occupations requiring complete mental alertness such as operating machinery or driving a motor vehicle. For the same reason, patients should be warned against the concomitant ingestion of zopiclone and alcohol or CNS depressant drugs. Pregnancy: For teratogenic effects see Warnings. Nonteratogenic effects: A child born to a mother who is on benzodiazepines or benzodiazepine-like agents may be at risk for withdrawal symptoms from the drug during the postnatal period. Lactation: Zopiclone is excreted in human milk, and its concentration may reach 50% of the plasma levels. Therefore, the administration of zopiclone to nursing mothers is not recommended. Children: The safety and effectiveness of zopiclone in children and young adults below the age of 18 have not been established. Geriatrics: Elderly patients are especially susceptible to dose-related adverse effects, such as drowsiness, dizziness, or impaired coordination. Inappropriate, heavy sedation may result in accidental events/falls. Therefore, the lowest possible dose should be used in these subjects. Adverse Reactions: The most common adverse reaction seen with zopiclone is taste alteration (bitter taste). Severe drowsiness and/or impaired coordination are signs of drug intolerance or excessive doses. The following adverse events were observed in patients receiving zopiclone. In the absence of an established cause-effect relationship those adverse reactions that were observed more frequently with zopiclone than with a placebo are in brackets. CNS: (somnolence), (asthenia), dizziness, (confusion), (anterograde amnesia or memory impairment), (feeling of drunkenness), (euphoria), nightmares, agitation, (anxiety or nervousness), hostility, (depression), decreased libido, (coordination abnormality), (hypotonia), tremor, muscle spasms, paresthesia, (speech disorder). Digestive: dry mouth, (coated tongue), (bad breath), nausea, vomiting, dyspepsia, diarrhea, (constipation), (anorexia or increased appetite). Dermatologic: rash, spots on skin, sweating. Rashes may be a sign of drug hypersensitivity; discontinue if this occurs. Metabolic and Nutritional: weight loss. Others: (bitter taste), headache, limb heaviness, chills. Laboratory Tests: There have been sporadic reports of abnormal laboratory test values including increase in AST, ALT or alkaline phosphatase values. Geriatrics: Geriatric patients tended to have a higher incidence of palpitations, vomiting, anorexia, sialorrhea, confusion, agitation, anxiety, tremor and sweating than younger patients. Symptoms And Treatment Of Overdose: Symptoms: In voluntary or accidental cases of zopiclone overdosage involving doses up to 340 mg, the principal effects reported were prolonged sleep, drowsiness, lethargy and ataxia. Full manifestation of zopiclone overdosage can be expected to be consistent with its pharmacological activity e.g., somnolence, confusion and coma with reduced or absent reflexes. Treatment: Treatment should be supportive and in response to clinical signs and symptoms. Respiration, pulse and blood pressure should be monitored and supported by general measures when necessary. Immediate gastric lavage should be performed. I.V. fluid should be administered and an adequate airway maintained. Hemodialysis is probably of no value. It should be borne in mind that multiple agents may have been ingested. Dosage And Administration: Treatment with zopiclone should usually not exceed 7 to 10 consecutive days. Use for more than 2 to 3 consecutive weeks requires complete re-evaluation of the patient. The product should be taken just before retiring for the night. Adults: The usual adult dose is 5 to 7.5 mg. The 7.5 mg dose should not be exceeded (see Precautions). Geriatrics: In the elderly and/or debilitated patient an initial dose of 3.75 mg at bedtime is recommended. The dose may be increased to 5.0 to 7.5 mg if the starting dose does not offer adequate therapeutic effect. Patients With Impaired Liver Function or Chronic Respiratory Insufficiency: The recommended dose is 3.75 mg depending on acceptability and efficacy. Up to 7.5 mg may be used with caution in appropriate cases. Zopiclone is not indicated for patients under 18 years of age. on the other, contains: zopiclone 5 mg. Nonmedicinal ingredients: calcium phosphate dibasic, hydroxypropylmethylcellulose, lactose, magnesium stearate, maize starch, sodium starch glycolate and titanium dioxide. Blister packs in boxes of 10, 30 and 100; white high density polyethylene bottles of 100 and 500.
on the other, contains: zopiclone 7.5 mg. Nonmedicinal ingredients: acetic anhydride, calcium phosphate, carnauba wax, cellulose, croscarmellose sodium, diethyl phthalate, FD&C Blue No. 1 aluminum lake, magnesium stearate, titane oxide and zein. Amber polystyrene bottles of 100 and 500.